Geologists from the University of Utah recently announced finding a remarkable array of dinosaur footprints on the Arizona-Utah border in the USA (figure 1).1 They described their find as ‘a dinosaur dance floor’ and said it was located alongside an oasis in a sandy desert 190 million years ago. Dinosaur tracks in sedimentary rocks are no longer unusual. They are found all over the world,2 especially in the Rocky Mountains and High Plains of the western United States. Millions of tracks are now known, some of them forming large areas with a huge amount of tracks. In some cases, there are so many tracks, that the strata are greatly mixed up or ‘dinoturbated’. Once in a while a new find will have some unusual features. This new dinosaur track site, actually a new interpretation of an old site, displays a few unusual features. Pothole-like impressions in the Navajo Sandstone had previous been interpreted as weathering pits. Now, it is believed the circular depressions were made by dinosaurs.3 The impressions are located within the Navajo Sandstone of the Paria Plateau of the USA at the Utah/Arizona border. Why are practically all the tracks going in the same direction? Animals usually mill around a watering hole, making tracks in multiple directions. Besides the strongly preferred orientation and the rare tail drag marks, a few other features are worthy of note. It is claimed that there were four types of dinosaurs including carnivores and herbivores. It is interesting that such enemies traveled the same path at probably near the same time. Also, the small tracks are interpreted to be the tracks of babies, a most unusual discovery, if the small impressions are really tracks, since tracks of babies are very rare. Also of interest is the author’s contradictory interpretation. The tracks are in the Navajo Sandstone, interpreted to be desert sand that lithified (hardened) into rock. So, they postulate a ‘desert oasis’ or watering hole. If this were the case, why are practically all the tracks going in the same direction? Animals usually mill around a watering hole, making tracks in multiple directions. What are dinosaurs doing in a monstrous desert? Figure 2. 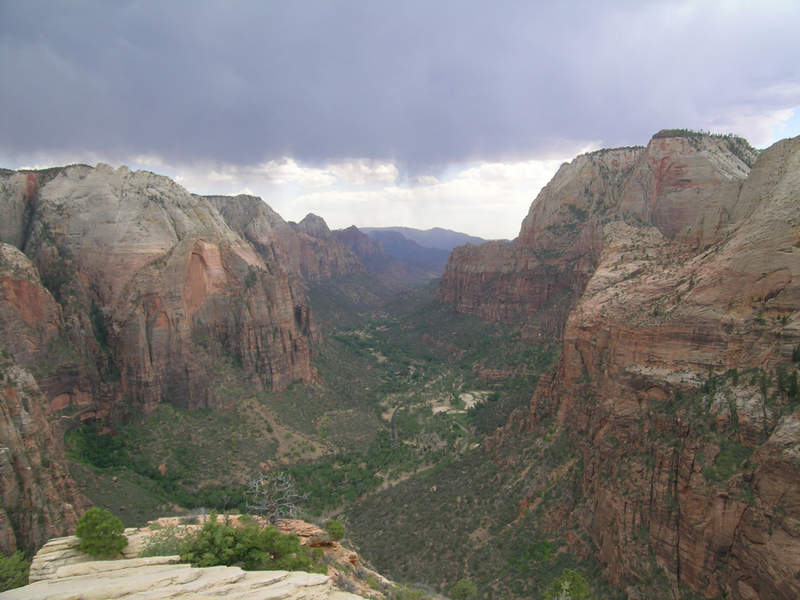 Navajo Sandstone up to 600 m high above Kayenta Formation in Zion National Park, Utah, as seen from the top of Angels Landing. The most contradictory feature is that the tracks are found in what is believed to have been a monstrous desert. 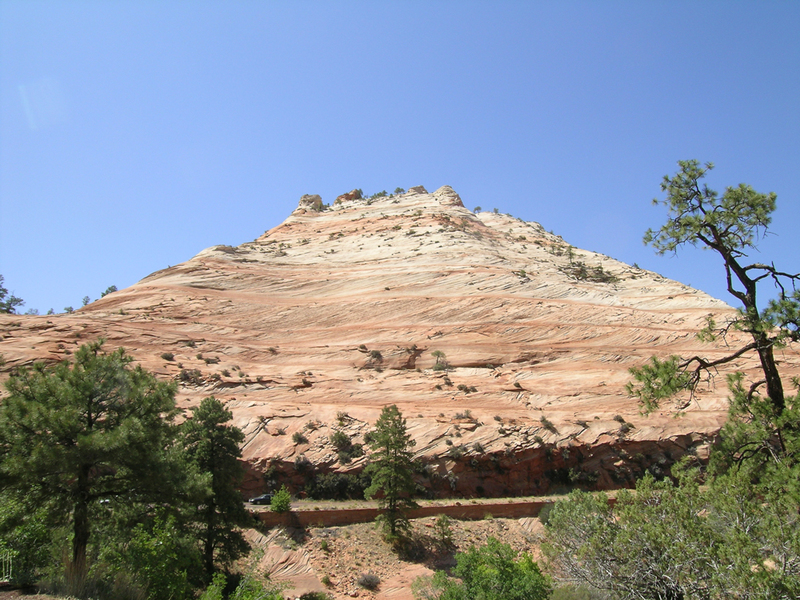 The Navajo Sandstone and its equivalent deposits occupy an area greater than 265,000 km2 and may have once been two and a half times as large before erosion. 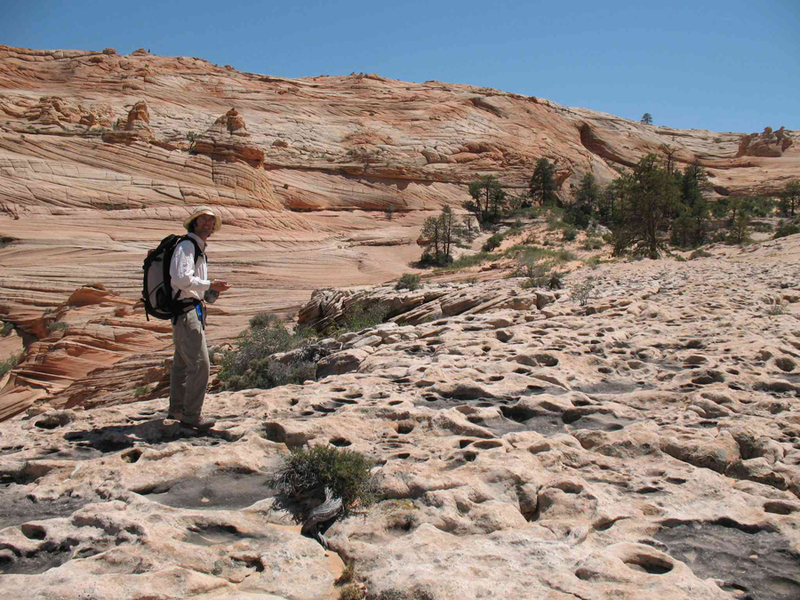 The Navajo Sandstone is up to about 600 m thick in south central Utah (figure 2). That makes this desert larger than the Sahara Desert! What are dinosaurs doing in a huge desert, even at an oasis? Desert oases are normally small and could hardly sustain dinosaurs in such large numbers. Moreover, there are 60 other track sites in the Navajo Sandstone, mostly of carnivorous dinosaurs. Just as mysterious from a uniformitarian point of view4 is that hardly any bones are found in the Navajo Sandstone. One would think that with shifting sands, a huge number of dinosaurs would easily be covered up, which is the first step in fossilization. The thousands if not millions of dinosaur tracks just in the Navajo Sandstone should be a big hint to uniformitarian scientists that this Sandstone is not from a desert environment. As we see with the Coconino Sandstone from Grand Canyon,5 there are several obvious features that strongly suggest a water-laid deposit. First, the sandstone is flat or nearly flat at both its lower and upper contacts. How many desert sands have such a property?6 To make matters worse, the overlying Carmel Formation is a marine formation7 that should have torn up the top of the Jurassic Sandstone (as well as the thin desert Temple Cap Formation), but the contact is very flat. Figure 3. Navajo Sandstone with cross beds and multiple truncating planation surfaces near Checkerboard Mesa, Zion National park, United States. Second, within the thick Navajo Sandstone, the cross beds are truncated by flat planation surfaces that can sometimes be traced for kilometers. Dozens of these planation surfaces can be seen in tall vertical exposures of the Navajo Sandstone (figure 3). What sort of desert process shears off sand dunes? Although uniformitarian scientists have attempted to explain such anomalous features, the lack of any close modern analog shows that they are grasping at straws. Third, the sand grains that are well-rounded and frosted, providing evidence for the desert interpretation, show that the frosting was not by wind abrasion. Scanning electron micrographs show that the frosted surface is actually etched.8 In other words, the grains have been chemically frosted, probably after deposition by water moving under pressure through the spaces between grains. Fourth, the direction of transport of the sand is the same as the general transport of practically all the supposed eolian sandstones on the Colorado Plateau.9 The direction is from the north to the northwest. A further problem is that the transport direction must be maintained for hundreds if not thousands of kilometers, since there is no source for the sand immediately to the north of the Colorado Plateau. Such consistent directions over a supposedly 100-million-year period make little sense. In all that time, why wouldn’t a significant change in wind direction, from the south for instance, deposit some dunes with a different orientation? These unusual dinosaur tracks and their strongly preferred orientation provide more evidence for the ‘briefly exposed Flood sediment hypothesis’.10–12 Tracks, as well as dinosaur eggs, were made by dinosaurs during the Flood while they were still alive, as the waters were rising. They would have perished later on, at least by Day 150, when the entire earth was covered by water and every lving thing perished (Genesis 7:20–24). Based on many unusual features of dinosaur tracks, eggs, and bonebeds, freshly-laid Flood sediments must have become briefly exposed during the first half of the Flood as the waters were rising. Such an exposure can easily be accomplished after heavy sedimentation and a brief drop in ‘sea level’ (and there are at least four mechanisms that could cause this). Dinosaurs coming ashore onto this ‘land’ would of course make tracks and lay eggs. Their death en masse would produce large bonebeds as found in other parts of the fossil record, graveyards that sometimes contain thousands of dinosaur remains. University of Utah, ‘A dinosaur dance floor’: numerous tracks at Jurassic oasis on Arizona-Utah border. http://www.physorg.com/news143692605.html, October 20, 2008. Return to text. Oard, M. J., The extinction of the dinosaurs, Journal of Creation 11(2):137–154, 1997. Return to text. Seiler, W.M. and Chan, M.A., A wet interdune dinosaur trampled surface in the Jurassic Navajo Sandstone, Coyote Buttes, Arizona: rare preservation of multiple track types and tail traces, Palaios 23:700–710, 2008. Return to text. Uniformitarian thinking assumes that the past can be explained by the sorts of geological environments that we see on the earth today (such as deserts, rivers, and volcanoes, and present-day processes such as slow sedimentation and erosion) persisting over millions of years, and denies that the global Flood described in the Bible ever occurred. Return to text. Austin, S.A., Grand Canyon: Monument to Catastrophe, Institute for Creation Research, Santee, CA, pp. 21–56, 75, 1994. Return to text. Hamilton, W.L., The Sculpturing of Zion: guide to the Geology of Zion National Park, Zion Natural History Association, Springdale, UT, 1992. Return to text. Hamilton, ref. 6, p. 86. Return to text. Hamilton, ref. 6, p. 83. Return to text. Baars, D.L., The Colorado Plateau: A Geologic History, University of New Mexico Press, Albuquerque, New Mexico, 2000. Return to text. Oard, M.J., Polar dinosaurs and the Genesis Flood. Creation Research Society Quarterly 32:47–56, 1995. Return to text. Oard, ref. 2, pp. 144–147. Return to text. Oard, M.J., Dinosaur tracks, eggs, and bonebeds; in: Oard, M.J. and Reed J.K.(eds), Rock Solid Answers: Responses to Popular Objections to Biblical Geology, Master Books, Green Forest, AR, 2009 (in press). Return to text.